In this episode, I talk with Brian Winnikens of Reel Country 1430 in Durand, WI on Friday, November 29. It’s an interesting discussion and the topics range widely. 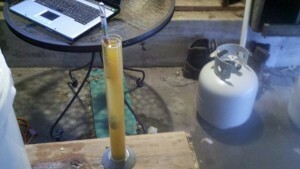 On the homebrewing front, we discuss a not-quite-right beer I brewed for a competition. I needed to make a stout without any barley roasted darker than 3 Lovibond in color. It looked like pale ale. We sampled a commercial pumpkin ale purchased at Trader Joe’s and talked about what is in pumpkin beer as well as some of the techniques for making a pumpkin beer. Brian brings up a news story about Celtic Renewables trying to use the waste products from Scotland’s distilleries to produce biobutanol as an alternative fuel source. Enjoy the discussion. As always, send questions or discussion topis to podcast@superbrewers.com! Previous Previous post: Ring in the New Year with a New Beer! Next Next post: Christmas Gift Ideas for Your Favorite Homebrewer!